As we explained in part 1, new-born photography has a lot more to it than you may initially think. 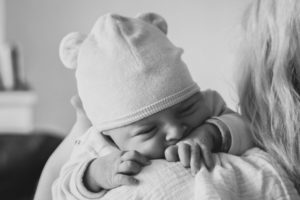 Before putting your photography skills up to the challenge, there are a few things that you will have to think about before the new-born photography shoot. We’ve already covered five of them in the first instalment of this blog post, so catch up and then re-visit us here in part 2 to hear about all ten of our top tips! Tip #6: Creative Props – Props can make or break a photograph and when it comes to new-born photography, props are a pretty big part of the images that you’ll take. Creative props can be the difference between a professional photo and an amateur one. New-born props don’t have to be expensive and you can find most of what you need at home or a local crafting stores in your area. If you’re stuck on ideas for props to use throughout your new-born photo shoots, think about the parents of the baby. Maybe you could incorporate their hobbies or their culture. What about their favourite colours and individual personalities? 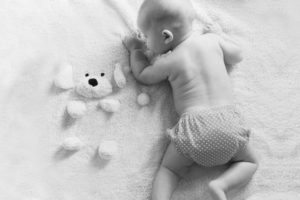 Using special touches like this when it comes to choosing your scene and the props that you’re going to use will make those images all the more meaningful to the parents of the new-born baby. Tip #7: Coordination – We recommend planning your scenes with colour coordination matches in mind. Visualising certain colours together before shooting day arrives will help you to produce the best visual images possible. Being able to see the colours together visually prior to going out and looking for the props and backdrops will save you hours and hours of work! That sounds pretty ideal to us. If you think about what kind of look that you’re going for first, then the colours will lead from that naturally and if you need to purchase props to complete the look, then make sure that they go with the current theme to ensure that the picture isn’t too overcrowded with colour. Stick with the theme, colour coordination and prop coordination are the dream team! Tip #8: Lighting – You certainly don’t need to get too fancy with the lighting. All you need is a large window for your main light and a Westcott 5 in 1 Reflector to help fill in some of your shadows. Maybe you haven’t noticed, but with a lot of modern-day new-born photo shoots, there’s hardly a shadow to be seen! We think that’s because it’s considered to be the desirable look when photographing babies and young children. Fewer shadows causes the photograph to appear brighter and cleaner of a sense. If you’ve got a shoot coming up which you’re beginning to think about and plan for, make sure that a good lighting is something that is at the forefront of your thoughts. Tip #9: Be Flexible – One thing that you may not be expecting to abide by is the new-born baby’s schedule. That’s right, it’s not just you who has things to do you know. Take that topic up with a new-born. Don’t be too surprised if the bubba you’re photographing becomes a little fussy during the day, the best advice that we can give to you on that subject is to take your time and wait it out. Or wait for the storm to pass as they say. We’ve heard it before, would you believe that some photographers spend 3-4 hours on a shoot with the baby crying the entire time and finally, in the last 20 minutes, they capture everything they wanted from the entire shoot? It wouldn’t be easy of course, but it is possible to move through the stages, even if a toddler tantrum occurs. Your new-born baby shoots will vary in terms of duration and this is dependent on a number of factors. Wardrobe changes and scene set ups are among them. In general, though, flexibility is key. If you’re a professional new-born/ baby photographer, you should consider charging per session, per image, or per scene rather than charging per hour. This will ensure that you achieve a stable income from your business. Tip #10: Post Production – Your post production for new-born photography will generally be lighter and airier than other types of photography. Consider using fades, tasteful black and white effects. Also consider brushing up on advanced Photoshop techniques like Frequency Separation and other advanced retouching techniques. TOP TIP: If you’re new to Photoshop and/or Lightroom, you should consider outsourcing your post-production and retouching to companies that specialise in editing new-born photos. 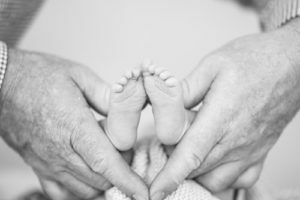 We hope you’ve enjoyed learning the basic points to consider when it comes down to shooting new-born photography. Come and join us over on Facebook here!